Tea friends are the best at sharing great shopping tips, and I got a fine one recently when Joy e-mailed to let me know that the Kindle version of a book on my Amazon wish list was available that day for free! 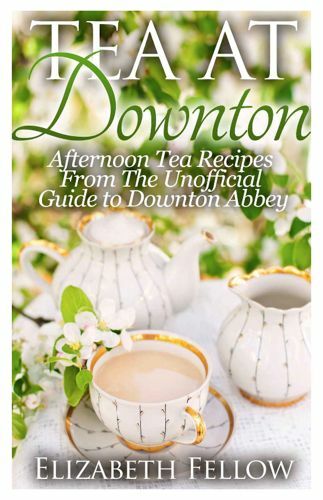 I had been debating whether to order a paperback book or the e-book version of Elizabeth Fellow's "Tea at Downton," and of course I claimed a free e-book as soon as I heard about this deal! 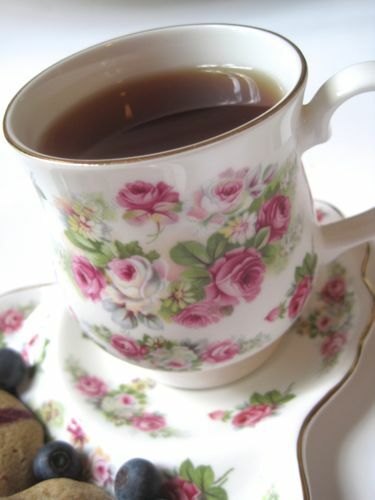 Fellow includes information on the origins and history of teatime as well as the proper way to make a pot of tea. 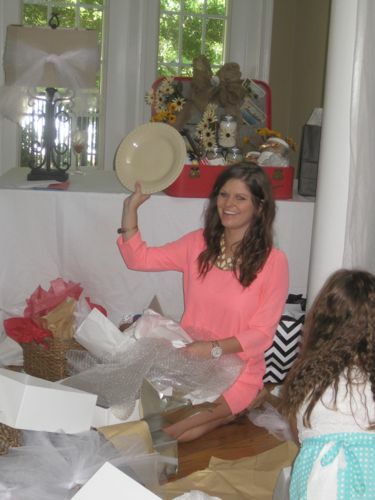 She writes, "Traditionally the pot would have been placed, by the tea boy, in front of the hostess in order that she could serve to her guests. If however something occurred to stop this happening, then the person closest to the pot should offer to take over. The traditional way to do this is to ask the question 'Shall I be mother?'" I'd heard of asking "Shall I be mother?" before, but I must say I have not heard of having "a tea boy." I don't know about you, but I'd much rather have a "tea boy" than a "pool boy." (If we're daydreaming about house staff, I mean.) Fellow refers to Downton Abbey's staff by noting that we can learn from Mrs. Patmore, who "would make use of what she had" when cooking, and I quite agree! 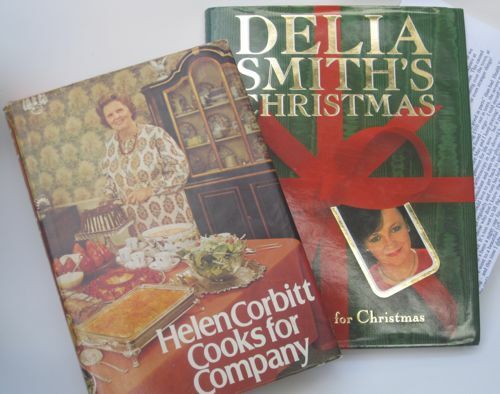 Recipes in the book include traditional teatime fare such as sandwiches, scones and sweets, and for the Downton fan it's quite fun to consider whether to make Lady Mary's Smoked Salmon and Dill Sandwiches, Mrs. Hughes' Cheese and Egg Sandwiches, The Countess' Lemon Curd, Anna's Egg Custards, Mrs. Patmore's Yorkshire Curd Tarts, or Carson's Sunday Afternoon Parkin (a soft cake). Now that I'm up to speed on all the "Downton Abbey" episodes, I am eager to host a Downton-themed tea next winter when the show returns to PBS. If that strikes your fancy as well, you can check out this e-book, currently selling for $2.99, here! 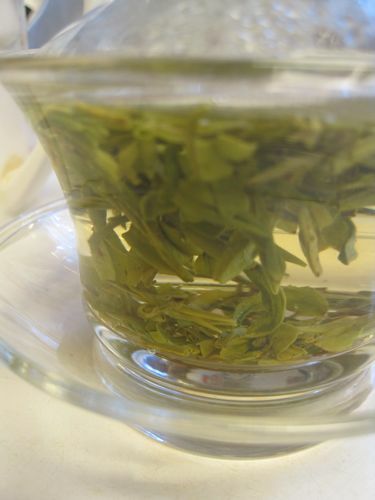 I cannot think about green teas without recalling that local coffee shop owner a few years back who told me to let my cup of green tea steep for *20 minutes. * Even as a tea newbie I knew that was wrong, and I imagine few people in that coffee shop (since closed) ever ordered green tea from him twice! Steeping greens is a delicate thing, I think, so I wasn't at all surprised to have to tweak my steeping time for this Organic Superfine Dragon Well Long Jing Green Tea from Teavivre. I appreciate the fact that their instructions say to steep this tea "for 1 to 6 minutes." To me, that recognizes that different palates are at work here, and everyone needs to find the steeping time that's right for her (or him). I tried steeping this tea for 2 minutes at first. It had a strong roasted scent, and I suspected the tea might be a little strong for me. It was, so I steeped the tea again for just 1 minute, and this was just right. The tea had a nice brothy taste, and I feel so virtuous when sipping green teas because I know they're tasty AND good for me! 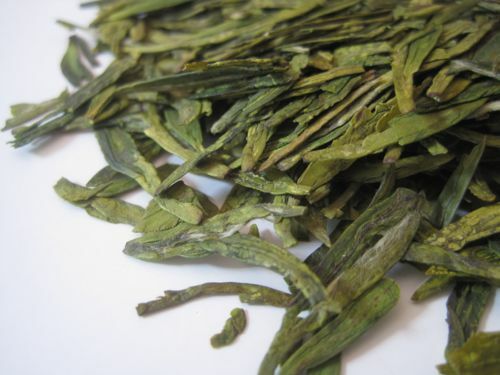 The next Teavivre tea I sampled was this Bi Luo Chun Green Tea (or Pi Lo Chun). 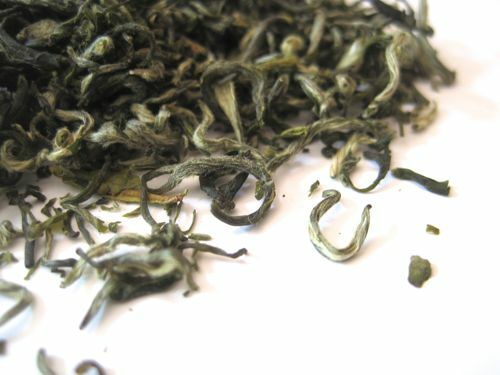 I often find beauty in the appearance of loose tea, and that was especially the case with this one. The wiry little leaves reminded me of pencil shavings, but these pencil shavings had little white hairs on them! 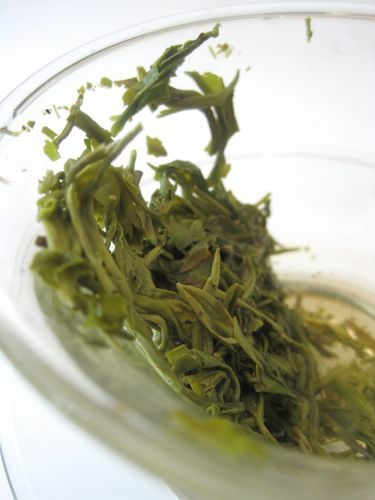 This was a mild green tea with a nice vegetal taste and just a touch of astringency, and I liked it very much! After trying a few flavored teas that were duds lately, it was extra nice to experience some "classic" tea flavors once again! The following recipe appears courtesy of Gluten-free With No Apologies: Southern-style & comfort food recipes-taste so good you won't have to apologize that they're gluten-free! by Deberah Williams and Amelia Cronic. You can go here if you'd like to order the paperback book or an e-book of your own! 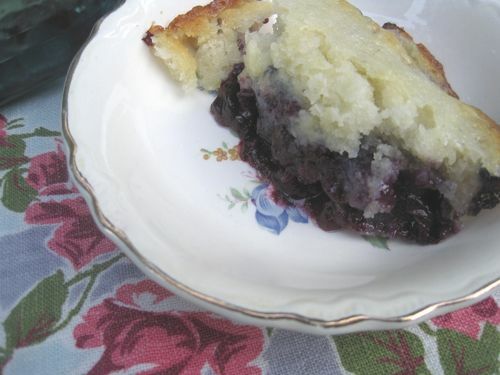 Deberah writes, "The original version of this pie has been used in our family for generations. It was used when there wasn’t time to make a regular pie or cake. Even though it is easy to make, it has great flavor. It is best cooked with blueberries, blackberries, or peaches." Heat oven to 375 degrees. In an 8 x 8-inch or equivalent baking dish, melt butter in the microwave. In a small mixing bowl, combine sweet (glutinous) rice flour, sorghum flour, potato starch, baking powder, salt, sugar, and milk. Stir just until all is mixed, then pour on top of the melted butter. Layer the fruit on top and bake for 30 to 45 minutes, or up to 1 hour if frozen fruit is used. Pie will be lightly brown and firm to the touch but soft inside like a pie. Makes 6 servings. Heat oven to 375 degrees. In an 8 x 8-inch or equivalent baking dish, melt butter in the microwave. In a small mixing bowl, combine flour, baking powder, salt, sugar, and buttermilk. Stir just until all is mixed, then pour on top of the melted butter. 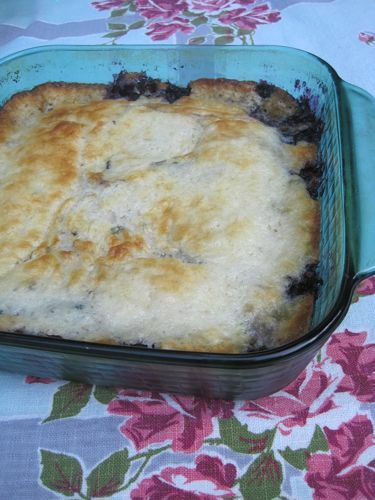 Layer the blueberries on top and bake for 30 to 45 minutes, or up to 1 hour if frozen fruit is used. Pie will be lightly brown and firm to the touch but soft inside like a pie. Makes 6 servings. Some of you may recall that in September, I will have the honor of hosting a Bridesmaids' Luncheon and Tea for my young friend Cydney. 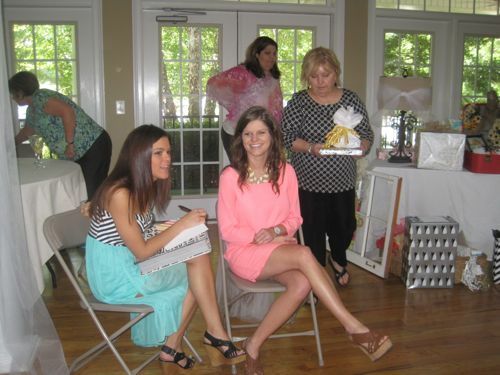 On Saturday I attended a Bridal Shower for Cydney here in Newnan, so I thought you might enjoy learning a little about this sweet bride who is so dear to me! 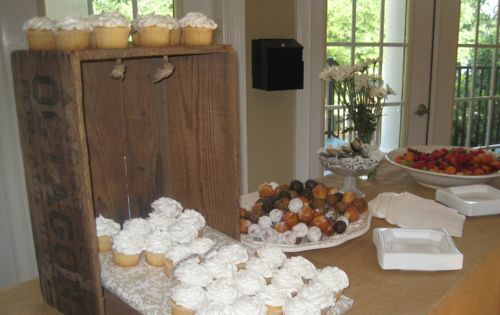 The tables held an assortment of finger sandwiches, sweets, fruit and these cupcakes, which I thought were charmingly presented in the shape of a wedding gown with a rhinestone "belt" accent! My favorite of the many wonderful gifts Cydney received came from another Angela, a young lady who is one of her bridesmaids. 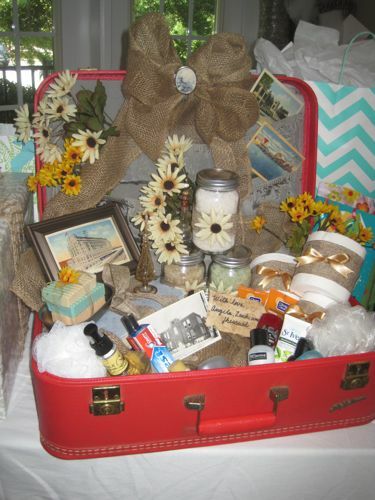 I absolutely love how Angela took a vintage suitcase and vintage postcards and did a bathroom-themed gift, chock full of neat toiletries for the bride and groom to enjoy. This is my kind of gift! After the shower games, it was time to open gifts, and Cydney's younger sister Alley was by her side to help record the gifts. 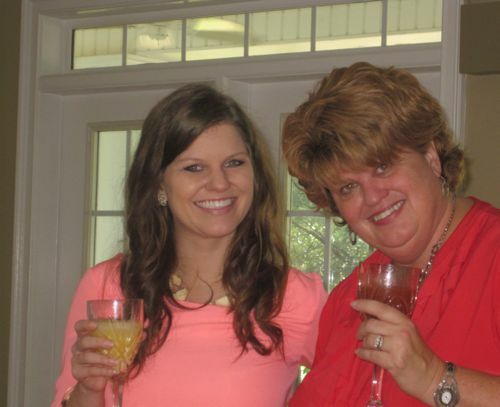 And here's Cydney with her mom, my friend Liz. 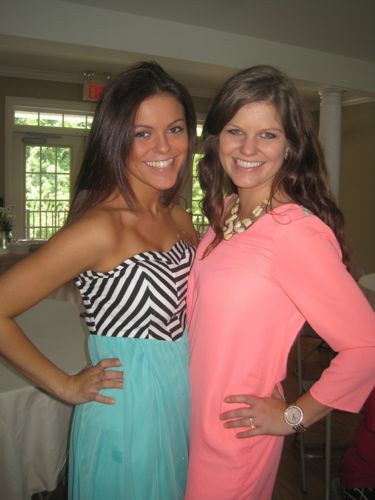 I used to have tea parties with Cydney and Alley when they were little girls, and it's a bit hard to imagine that one of them is now old enough to be getting married, but I sure am excited for this sweet girl! This tea room postcard is postally unused, but I like it anyway because of the great image of the neon lettering, the green awnings, and the aluminum folding chairs, for heaven's sake! 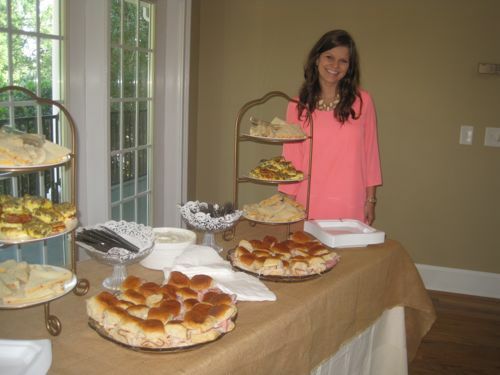 I'll bet I would have liked Ila, and I'll bet I would have enjoyed eating in Ila's Tea Room. 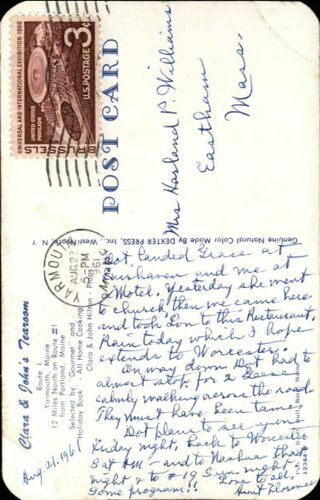 The back of the postcard notes that Ila's "has long been a landmark for travelers who enjoy good food in relaxing, attractive surroundings." That's the sort of phrase I see pretty regularly on these old postcards, and I always wonder, who are the people who enjoyed eating food in stressful, ugly surroundings? I also think I might have enjoyed shopping for gifts at "one of the best known displays in the north-east." And a floral department was recently added? Sounds like Ila's was a one-stop shop! The new issue of Daphne's Diary magazine landed in my mailbox the other day, and this one is especially wonderful for those of us who love teatime! 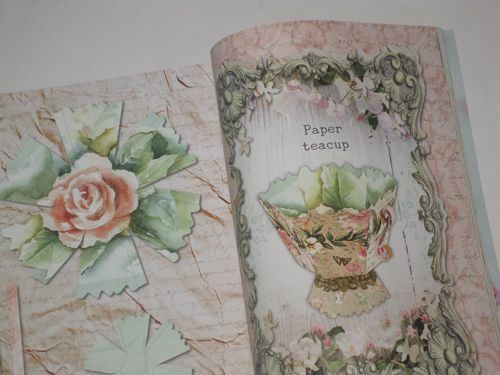 The papercrafts pages this time include punch-out images for making a paper teacup, about as easy a tea craft as you could hope to find. I'm leaving mine intact until I get ready to actually use the paper teacup for a tea event. And the featured artists in this issue include Beccy Ridsdel, an English artist whose unusual artwork explores the "hidden layers" of porcelain. "I wanted to focus people's attention on the hidden beauty in all sorts of different things," she says. 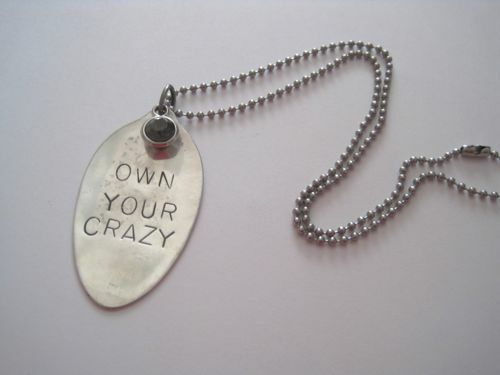 "And to remind them to look beyond the surface." You can visit her shop here to see more of her art. I ordered this issue of Daphne's Diary from a magazine company in the UK, by the way, but there were some, shall we say, "complications." I'm unable to recommend the company at this time, so I'll be back to searching Barnes and Noble stores for the next issue. 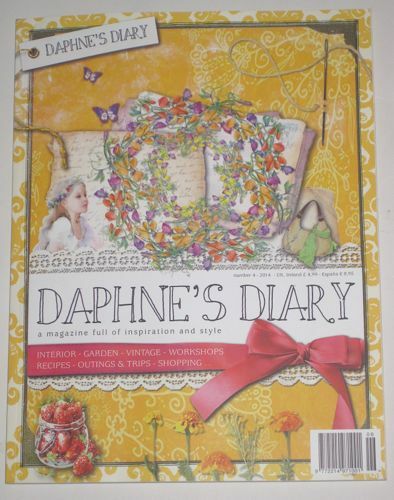 Daphne's Diary is definitely worth the search, though, and this issue is one of the best yet! Guess what fruit is in season at my dad's house. Did you guess blueberries? Why yes, it is indeed blueberry season. How'd you know? I've already made a blueberry cobbler (it prompted my once-a-year purchase of vanilla ice cream), had a blueberry salad, eaten lots of blueberries right out of the fridge, and I got to wondering, can you make cookies with blueberries? I'm not talking dried blueberry cookies but fresh blueberry cookies. 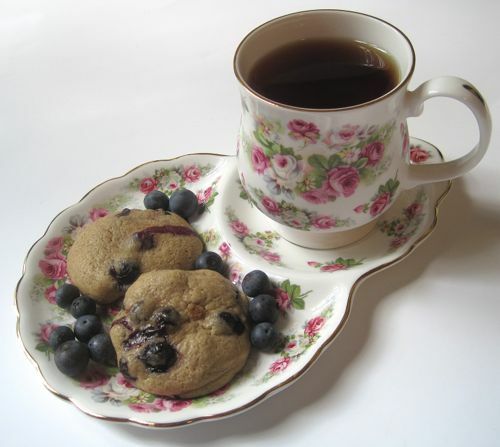 The answer is yes, and I found a wonderful and easy recipe for Brown Sugar Blueberry Cookies at the How Sweet It Is blog. 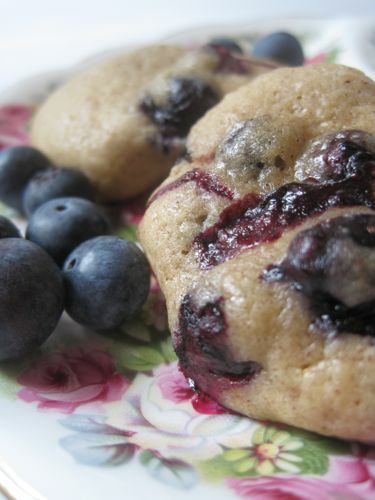 These cookies bake up nice and soft, almost muffin-like in texture, and I love that they contain whole, fresh blueberries. For once I made the recipe exactly as it is written, and the only thing I would add is that I lined my cookie sheets with parchment paper to make the baking a little tidier. Click here for the recipe. 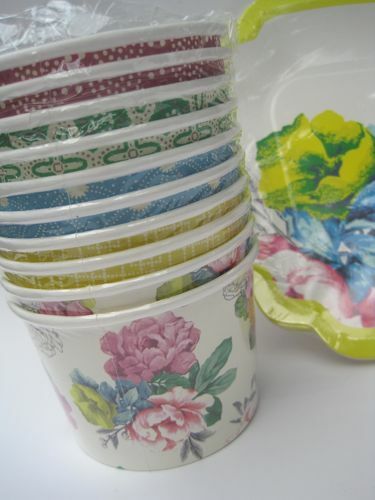 I think cookies (or anything, for that matter) taste better off pretty china, and I recently rediscovered a tea and toast set I had stored in back of a cabinet, a set marked Crown Victorian from Staffordshire, England. 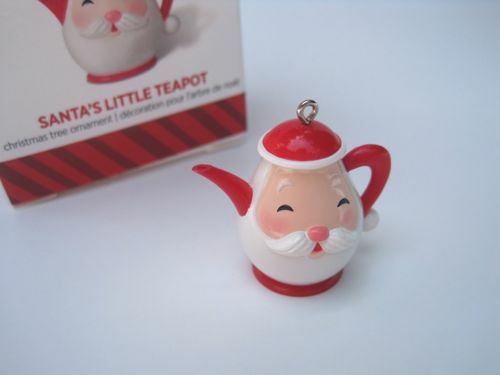 It sure makes a teatime snack more enjoyable when it's eaten off pretty teaware, doesn't it! 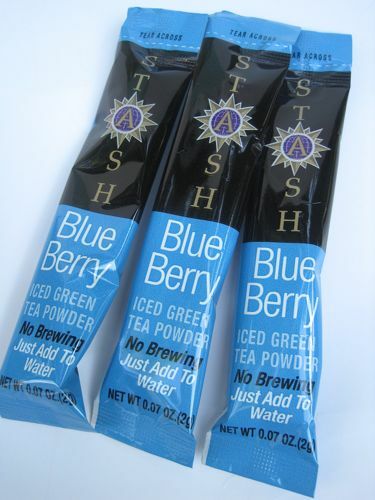 Stash is a trusted name in tea to me, so when I saw these blueberry green tea "powder sticks" at Ross last week, I decided to try them. I was expecting the water to turn blue or purple, so I was a little surprised when it had this murky green appearance. Hmm. "Just Add To Water," it said, so I did. 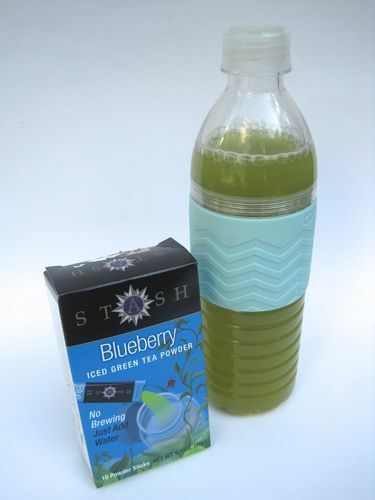 But when I added a packet to my 16.9-ounce bottle of water, the recommended size, and took a sip, I could barely taste anything, much less a blueberry flavor. I added a second whole packet of the iced tea mix. Still, nothing but a wimpy tasting drink. I asked my husband to taste it and see what he thought. He looked a little confused after he sipped. "Whatever it is, it's very mild," he said. "Exactly!" I said, and explained that after using TWO packets I still couldn't taste anything. He then explained that he was just being nice when he described it as "mild" because he thought it was something I personally had mixed up. (I tried not to overanalyze that comment.) This is the first time I've tried a powdered tea mix that lacked taste, so I'll be sticking to the Lipton tea packets from now on. 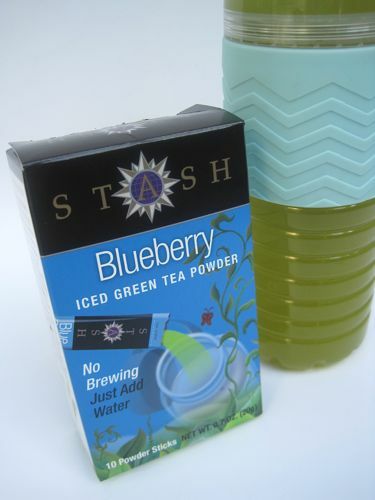 If you've tried the Stash brand of powdered tea mix, I'd love to hear your review! 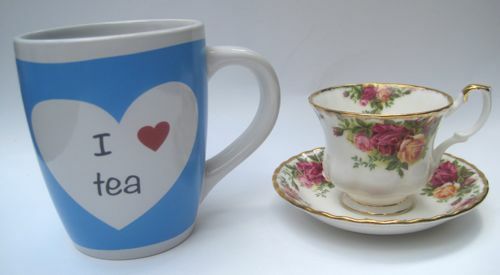 Have you ever wanted an easy solution for sharing some loose leaf tea with a friend? Well, I found it over the weekend at Ollie's Bargain Outlet in Carrollton! An Ollie's opened in my town a few months ago, but now I tend to shop the one in Carrollton when I'm off with my Aunt Jane since we both like it so much. I recently heard a friend describe Ollie's to someone as "Big Lots on steroids," which is pretty accurate. 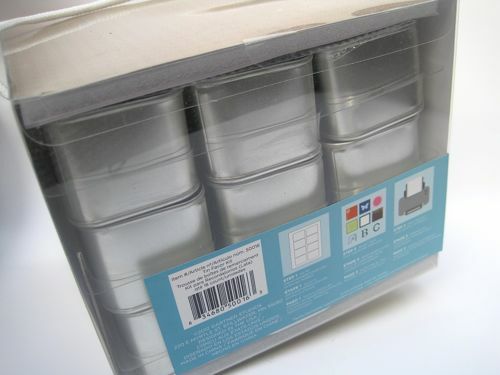 I especially like their book selection, but over the weekend I also found on the stationery aisle this package of 18 small metal tins for just $4.99 (regularly $19.99). These tins were designed to be used as wedding or party favors, but of course I looked at them and immediately saw future tea tins! 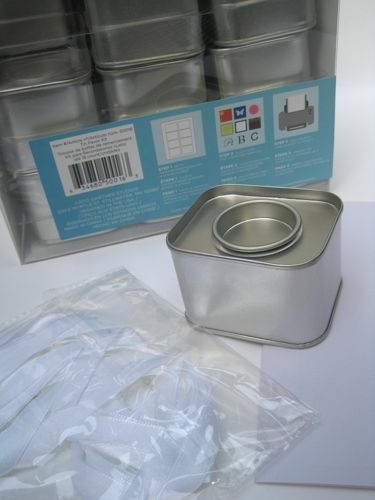 Each one is a rectangle of about 2 x 2-3/8 inches, and the tins are 1-1/2 inches tall. 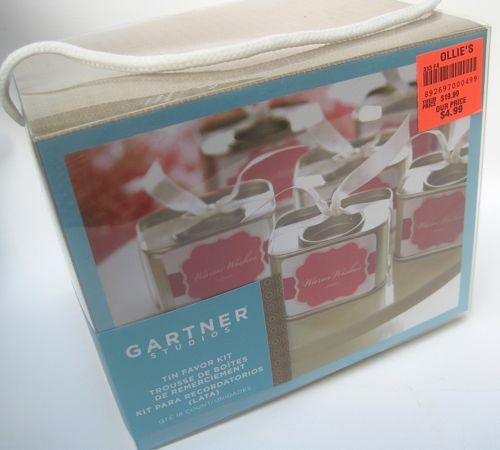 You can even go to the website of the manufacturer, Gartner Studios, to download templates for printing the stickers which are included, though I'll probably just write on mine or add a cute teapot sticker or something simple like that. 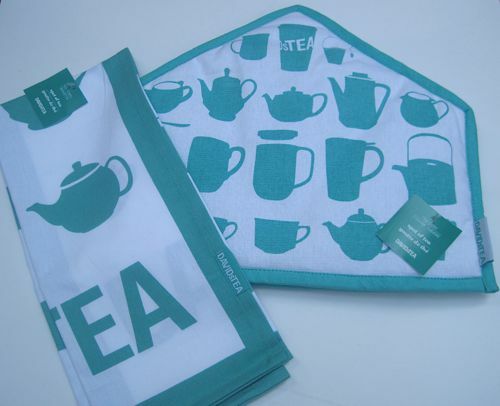 If you've ever wanted a nice way to share loose leaf tea with friends, I think this may be it! 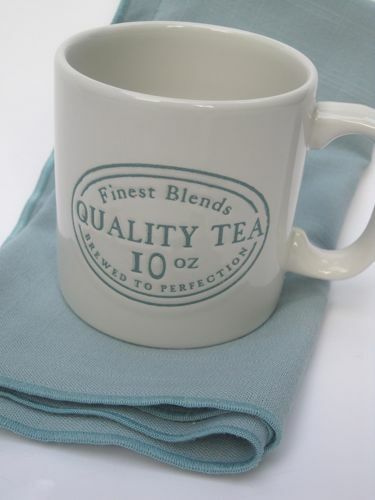 How to shop for a new tea mug — and more! So I was in England in May when I came across a display of some lovely but pricey tea mugs embossed with the name of one of the potteries. I wanted one, yes, but souvenir space was already at a premium so I resisted. 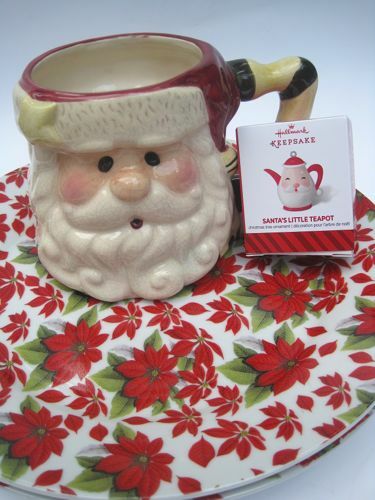 When I saw a similar tea mug at T.J. Maxx on Saturday, however, I did not resist, as this one was just $2.99 and I had no shortage of storage space on the way home. The curious thing, though, is that this short (3-1/8-inch tall) mug does not in fact hold 10 ounces of tea. I measured when I got home and found this mug *comfortably* holds just 8 ounces. Do you suppose someone figured that out about the mugs and that's why these ended up at T.J. Maxx here in the U.S.? 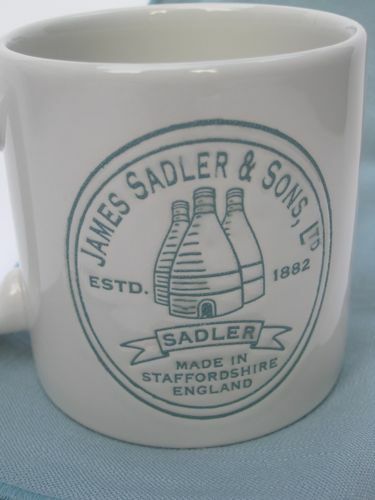 Still, I like my new little tea mug just fine, especially knowing it came from James Sadler! I also like that it features artwork of the potteries, which I learned more about in this book I reviewed earlier this year, the cover of which shows the old bottle-shaped kilns used to make teawares. 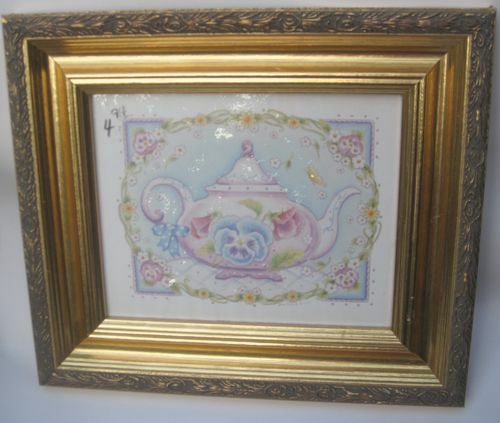 My other fun finds from the weekend's shopping with Aunt Jane included this 14-1/2 x 12-1/2-inch pansy teapot print. Just $4.94 at Goodwill. Not sure where I'll use it, but I have a firm policy of No Teapot Print Left Behind. 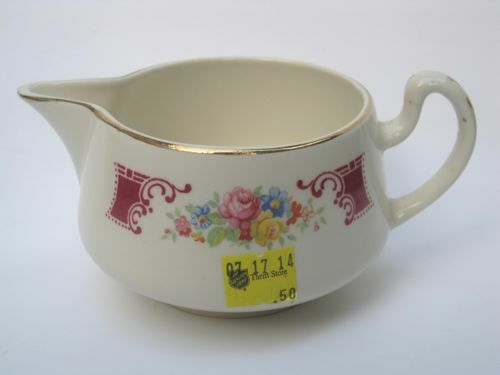 Last but not least, at Salvation Army I found this 50-cent creamer that is in the same pattern as the dishes my family had when I was a girl. It isn't marked, but a little online research revealed this is Homer Laughlin's Brittany Majestic pattern. Maybe this pattern can be my new "casual collectible," the sort of thing I can pick up when and if I see it at a good price. Like 50 cents! 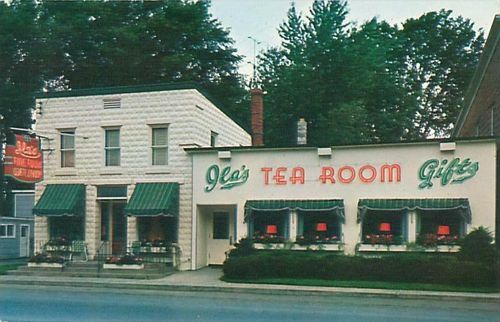 Clara and John's Tearoom, Yarmouth, Maine, 1961. Do you love this postcard photo as much as I do? The blue skies and puffy white clouds, the vintage cars, the flag pole out front that made me think this was a post office and not a tea room -- oh, I just love it! I used to think my favorite postcards were the "unspoiled" ones that were never actually sent through the mail, but I've since realized that learning the story behind the postcard is half the fun! This one, sent from "Aunt Florence" to Mrs. Harland P. Williams of Eastham, Mass. on Aug. 22, 1961, reads, "Dot landed Grace at Fairhaven (?) and me at a Motel. Yesterday she went to church, then we came here and took Lou to this Restaurant. Rain today which I hope extends to Worcester. On way down Dot had to almost stop for 2 Geese calmly walking across the road. They must have been tame. Dot plans to see you Friday night, back to Worcester (at) 8 AM - and to Nashua that night & to #19 Sun. night. Some program!! Love to all, Aunt Florence." 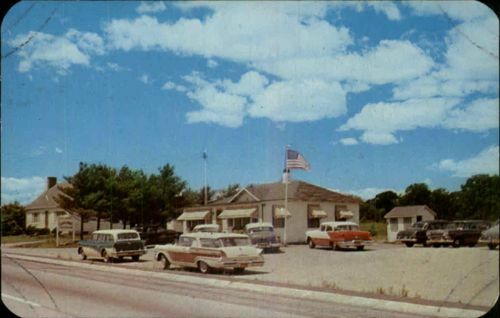 Fair Haven was the name of a summer camp in Maine (still in existence! 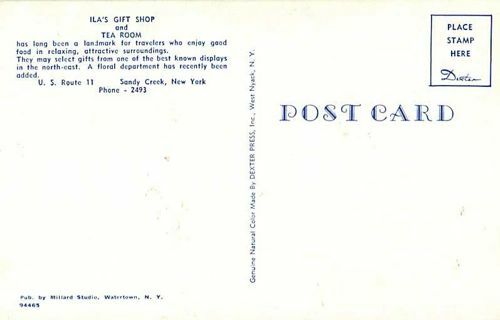 ), so I wonder if perhaps they were dropping off Grace at summer camp and that's when they happened upon this "tearoom" (one word), which the postcard's back tells us was "selected by 'Gourmet.'" A fun postcard, and it definitely brought back memories of my own trips to Rock Eagle 4-H Camp when I was a girl! Did any of you go to summer camp back in the day? Have you noticed how cake baking has become an art form these days? If you check out the cooking magazines on any newsstand, you'll likely see at least a few new titles devoted to elaborate cakes and how to make them. Even home bakers can now learn to make gorgeous fondant cakes, cakes with those trendy "icing roses," cakes with elaborate swirls and squiggles on them, and more. 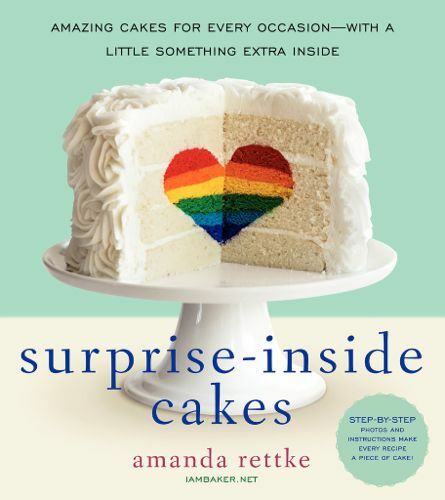 I do love a pretty and delicious cake, and if you do too you will enjoy a new book I recently received for review, "Surprise-Inside Cakes" by Amanda Rettke. Rettke explains how it was a move from bakery-rich Fargo, North Dakota to a small town in Minnesota (and having five children!) that caused her to learn to bake her own cookies and cakes. In 2009, she needed a cake to take to her church's potluck and created a "surprise-inside" Jack-o'-lantern Cake (included in the book) which was a big hit. 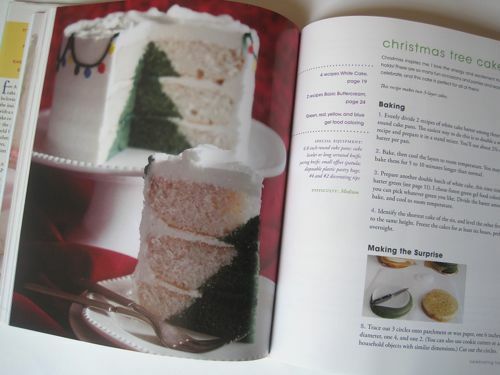 Some 40 cakes are featured in the book, which has great step-by-step instructions on how to make these surprise-inside cakes. Wouldn't it be fun to surprise guests with this Christmas Tree Cake? 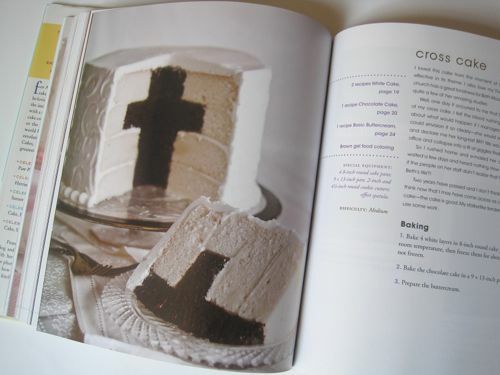 And what could be better to take to a Bible study than this Cross Cake? I may have to try this one! Rettke recommends "starting out simple" and says newbies shouldn't begin with the more elaborate creations like her Cowboy Boot Cake but instead start with one of the simple multi-colored layer cakes. 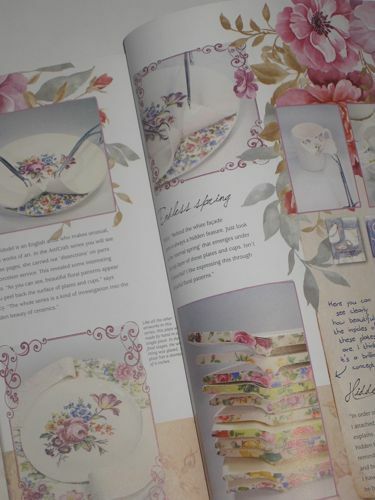 For those who wish to try the more advanced designs, the book includes step-by-step instructions and plentiful photos of the cutting, carving and filling. I'm amazed at Rettke's creativity with such treats as the Butterfly Cake, Ring Cake (the interior features a giant "diamond" ring) and even a Rudolph Cake. If you'd like to see more of her treats, visit her blog I Am Baker to see her latest creations, including a tutorial on the pretty Rose Cake that's so popular in magazines these days. (It's on the book's cover as well, but I was so awed by the rainbow heart I at first failed to note the icing roses on the cake!) And if you do decide to make one of these cakes, save me a slice, OK? If there's any sort of tea picnic in your future, you might want to check out the paper goods in Target next time you're by one. Over the weekend I came across this lovely "Poppytalk" line of paper products, and I absolutely love them, especially since each item was just three dollars! 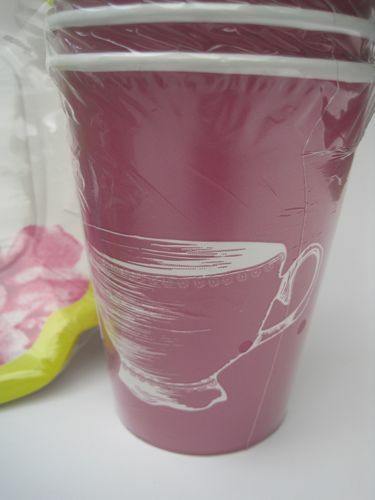 What first caught my eye, naturally, was the package of 12-ounce mauve paper cups with teacups on them. When my aunt and I went shopping Saturday, I had no idea just how much "Christmas in July" was going to be my theme that day! two for 99 cents.) 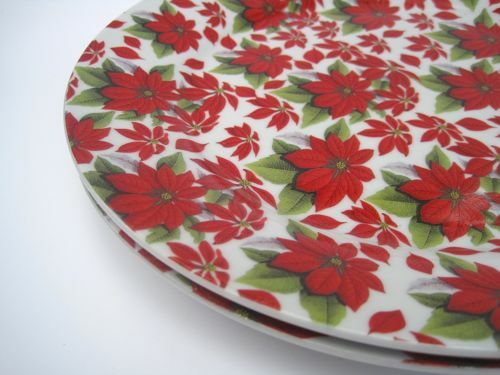 I've said it before and I'll say it again: NOW is the time to stock up on pretty plates, bowls and baskets for the serving and gifting of Christmas treats. If you end up having to pay $4.99 for an ugly clear plastic tray at the grocery store long about December 21, it won't be my fault! 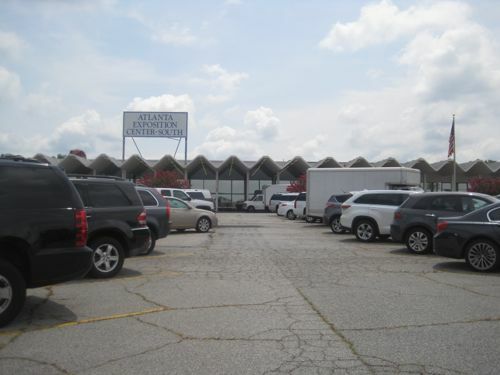 After Goodwill, my aunt and I headed to the mall in Douglasville. As we walked past Hallmark, I suddenly remembered that Joy had recently e-mailed me an alert about this cute new miniature ornament. I couldn't help noticing that while most of the other ornaments were stacked in full rows, quite a few of the little boxes in this row of teapot ornaments were gone, so I'm glad Joy told me early in the season about this new ornament. And now you know too! 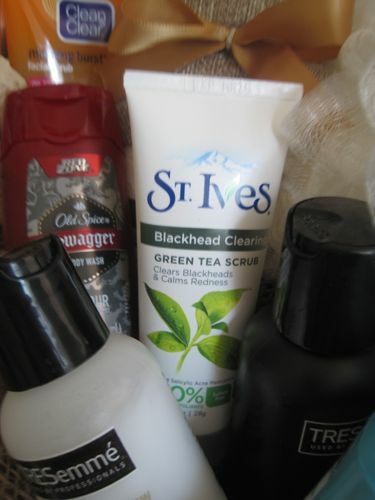 But these weren't the only Christmas goodies I would receive on Saturday, oh no. 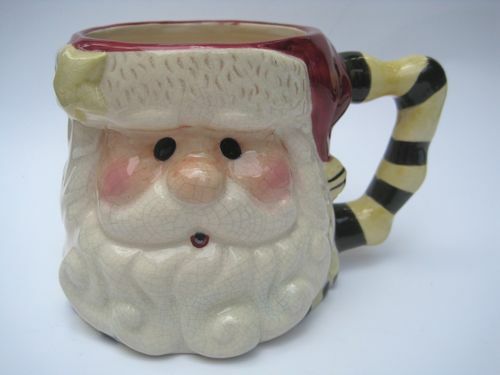 You see, Margaret from Canada had recently e-mailed to say she had a Santa mug she would be happy to pass along if I wanted it. Of course I did as a longtime collector of Santa mugs, and I was thrilled to find it waiting for me when I got home Saturday night! I don't mind duplicates at all, but boy, it's nice to receive a new design like this one as well! 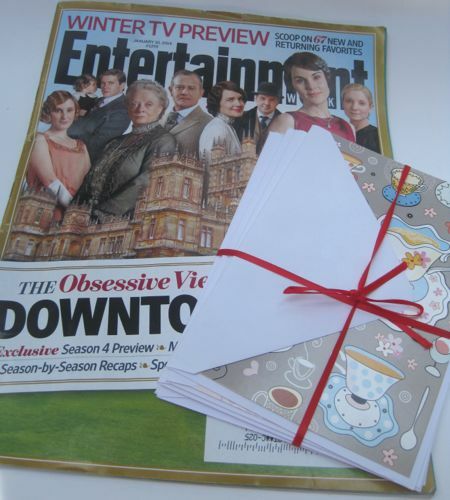 Margaret included a magazine with a great piece on "Downton Abbey," so I was delighted to find it as well. She also included a lovely assortment of notecards which I will of course put to good use! And last but not least, she included what is without a doubt the largest tea mug I've ever had, a 5-inch-tall mug that I placed next to an Old Country Roses teacup just to show you the size. This mug holds nearly a liter of tea, according to Margaret, and I'm tickled to have such a fun piece! When I finished opening all the gifts, I had such a pile of tissue paper and boxes around me that my husband said, "It looks like Christmas over there!" To which I can only say, "Ho ho ho! Merry Christmas!" 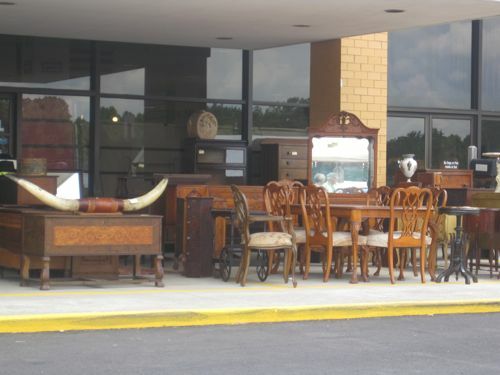 I can have the best time people watching at an antique mall or flea market. On Friday, I headed to Scott's Antique Market in Atlanta for the first time in a while, and I so enjoyed browsing for junk and pausing for a little people watching. There were the thin blonde "Real Housewives of Anywhere" wannabes with their maxi-dresses and designer purses. There were the Buckhead old-money socialites with the helmet-haired do's and leopard print blouses. 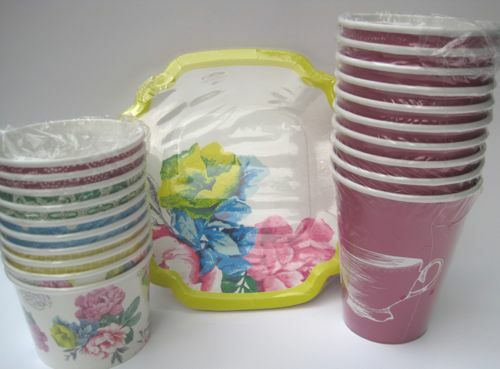 There were also those women I assume are Atlanta decorators because they were feverishly pulling tailored pillows off the shelves while an armful of bangle bracelets clattered away. This visit, I was also struck by how many dealers completely ignored all their customers because they were studying their smartphones and tablet computers. 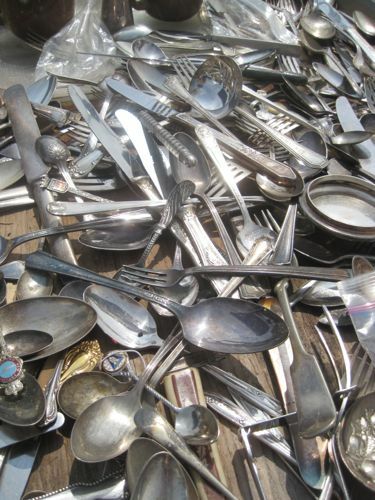 But I didn't really care because I was also a woman on a mission: I wanted to find some old silverplate knives, cheap, to use in styling a cake photo for a freelance project. If you're from the area you know this already, but if you're not, I should explain that Scott's is near I-75, held the second weekend each month (Thursday-Sunday), and it's in two buildings, North and South. I went to the South building first, and there I enjoyed looking at the costume jewelry, some ancient needlework samplers, and some pretty vintage linens. I saw hardly any teacups or teapots, which was surprising, but that was fine because I was on a mission to find old silverplate. I found a couple of sellers who had some, but there wasn't anything I just loved until I headed outdoors where the cheaper booths are located. This table caught my eye. I asked the man what his prices were, and he said they started at a dollar. I knew this was my kind of place! I soon picked out the five pieces I wanted. He bagged up my thrifty five-dollar purchase and I was done. A quick trip to the North building turned up some pretty old furniture but nothing I needed, so I headed home. What did I get? Three "new" knives, a fork and a spoon. 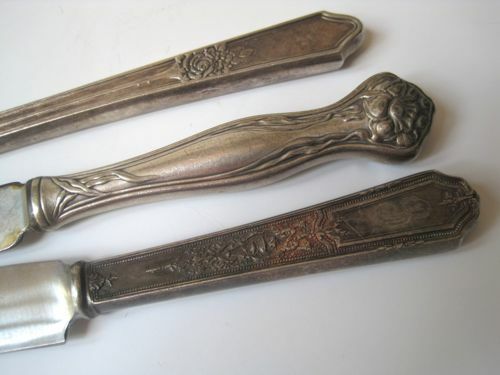 I'm really going for an old, rustic/rusty texture, and I hope one of these three knives will do the trick. 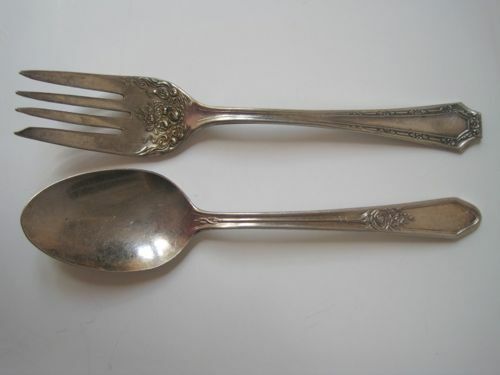 I also liked the floral designs on this fork and spoon, so they may appear in a photo one day as well. The fork is, I believe, a pastry fork because of that extra wide tine. 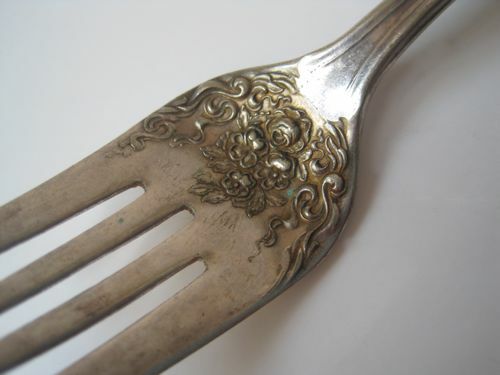 Whether it is or not, I don't think I've ever seen a fork with such an elaborate design near the tines like this. 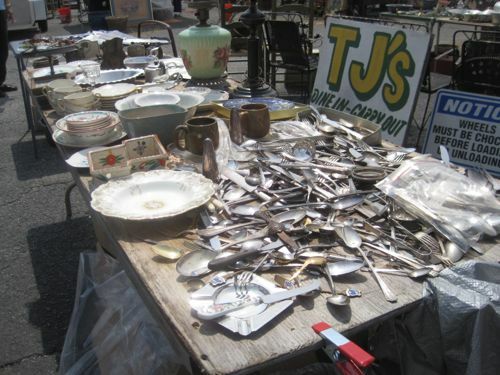 Do you ever visit the big antique market in your town? If so, what's the name of it? I might need to go there one day! Finding tea at Southern Roots Nursery & Gardens! A surprise tea gift from a new tea friend! Want to win "The Ladies' Book of Baking"? Artwork that suits me to a tea!